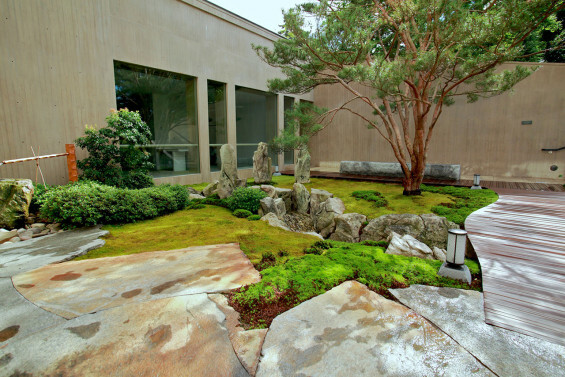 The Tiger Glen Garden is a courtyard garden in the new wing of the Johnson Museum of Art. 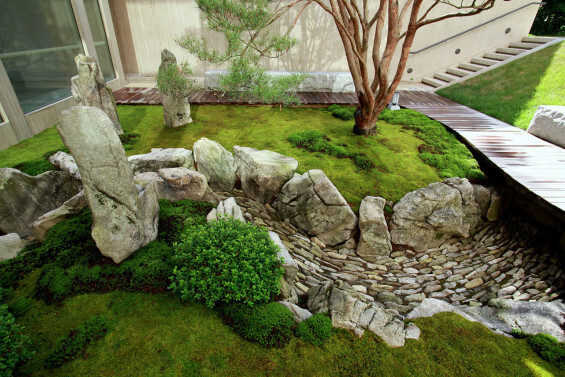 The design uses a minimalist palette of stone and moss to evoke an ancient Chinese parable known as the Three Laughers of the Tiger Glen. As such, the garden is not simply a restive place, the design of which is intended to be only pleasing and calming. It is a meaningful place. A garden that has a story to tell. The Three Laughers of the Tiger Glen is the story of three men who represent three religions and how they overcome their sectarian differences to find a unity of friendship. An important message for our times. The central figure in the parable is the Buddhist monk Huiyuan who had become a recluse and vowed never to cross the Tiger Glen, a ravine that separated his temple’s precincts from the rest of the world. One day, however, two old friends came to visit him: the Daoist priest Lu Xiujing and the Confucian poet Tao Yuanming. The three men had such a good time together, writing poetry and drinking rice wine, that as they concluded their visit Huiyuan inadvertently forgot his vow and crossed the bridge over the Tiger Glen with his guests. As soon as they realized what had happened, the three men experienced an epiphany at the absurdity of their former separation and burst into laughter. 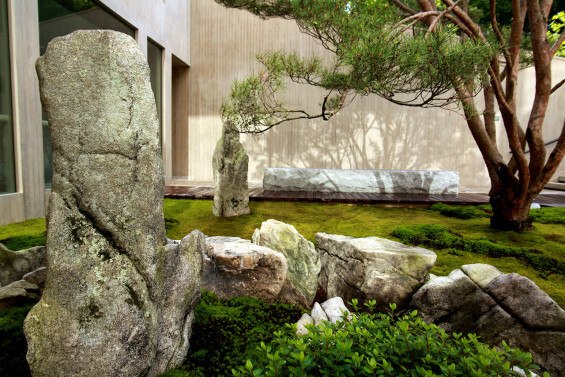 This parable of unity became a theme that was painted over the centuries by many artists in China, and later in Korea and Japan as well and, finally, became the impetus to design this contemporary garden in America. 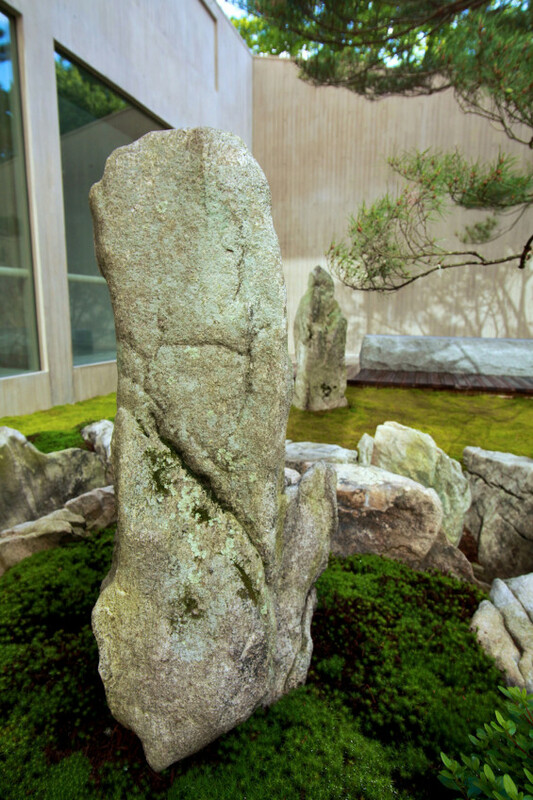 The Tiger Glen Garden abstracts the parable of the Three Laughers through a simple palette of materials, primarily stone and moss harvested from the hills of central Connecticut. The boulders are a type of metamorphic stone called gneiss that has both the layered quality of sedimentary stone and the softened quality of igneous stone. The moss groundcover is actually a quilt of many different mosses: at least 12 individual species all within 500 square feet. 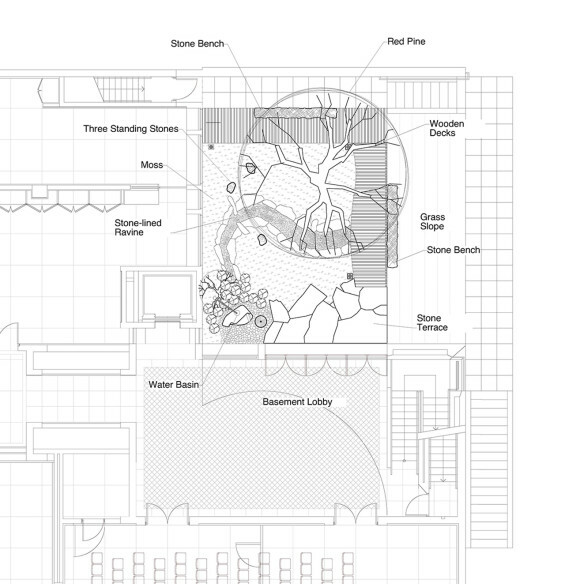 When designing a garden like this, the initial design drawings only represent the general concept of the garden. The actual work of designing the details of the garden happens through the process of collecting materials from the forest and the process of laying out those materials as the garden is being built. The garden you see is the result of an artistic process in which the materials themselves influence the design. 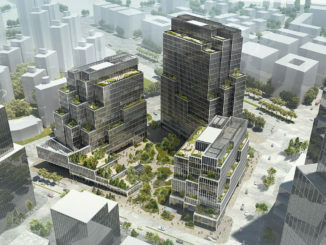 The architecture that surrounds the garden, designed by the architectural firm Pei Cobb Freed and Partners, also uses a simple palette: primarily exposed concrete and glass. Although both the garden and architecture are restrained in their palettes, the former is expressed in natural organic forms while the latter uses planar geometric ones. 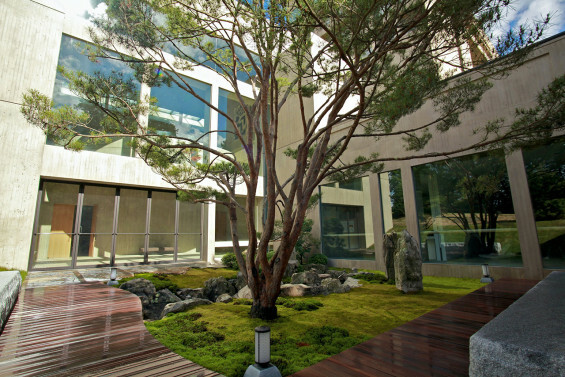 The garden and the architecture that it sits within are alike and contrasting at the same time. The design of the Tiger Glen Garden is based on a form of Japanese garden that was developed in the medieval period called karesansui. 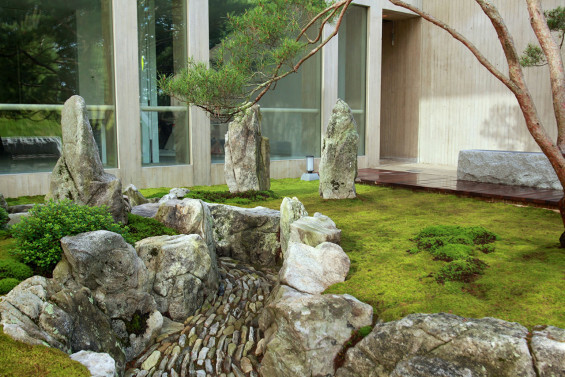 Simply put, karesansui gardens are abstract, sculptural representations of nature, which often have an allegorical meaning incorporated into their design. 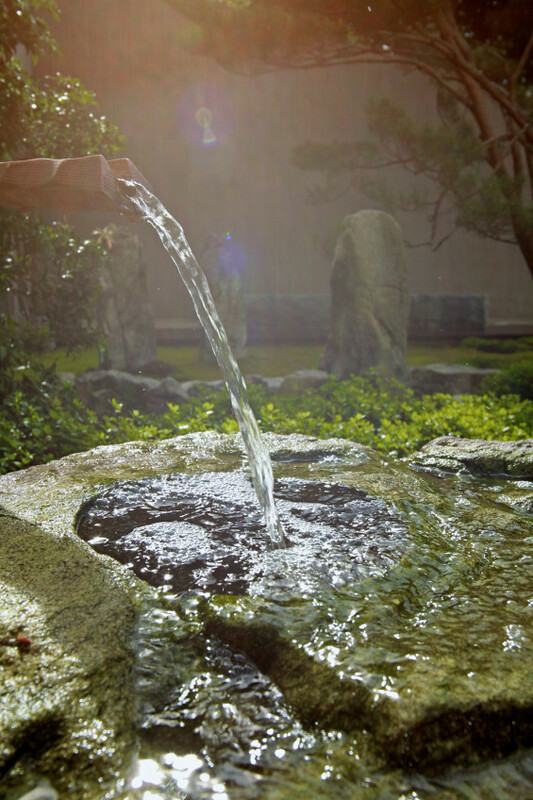 The word karesansui is written with the three characters for dry-mountain-water, in which ‘mountain-water’ means ‘nature,’ and ‘dry’ refers to the fact that water in the garden is represented symbolically through patterns of stones. Many karesansui gardens use white sand raked with wave patterns to evoke the feeling of water. 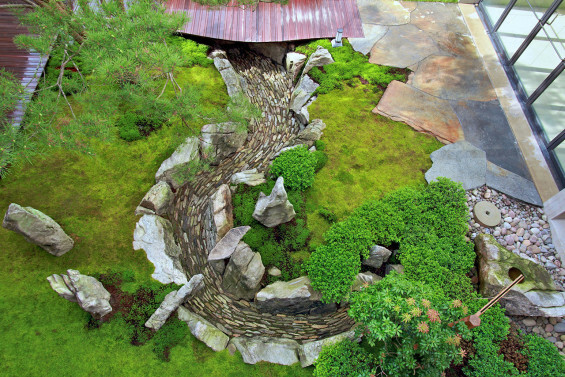 The Tiger Glen Garden expresses water through the use of hundreds of small weathered stones that create the image of a quickly running stream. The creation of the Tiger Glen Garden was made possible through the generous patronage of Rebecca and James Morgan.